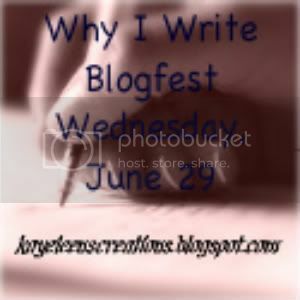 Kayeleen's Creation Corner: My first Blogfest!!!! Update: If you have been directed to this page from someone else's blog, please click through to my post that can be found here. I'll have to think about what to say - there are so many reasons! Congrats on your first blogfest! I can't wait to check out everyone's answers, count me in! I'm in! Will give this fest a plug on my blog. OK, got it in for next Monday. I was just thinking about this today, so it's a good time to write it down. looks fun, i'll post it too! I posted this on my blogfest page. Sounds like an interesting blogfest. I just added my name. 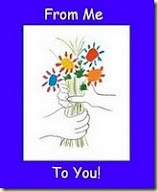 I'm running a signed book giveaway at my blog this week if anyone is interested. Count Me In! It'll be delightful to bore other writers with why I write, instead of just the family. I just want to hear what others have to say about this insanity! ps: are you related to Shannon Hamblin? This sounds fun! I can't wait until Wednesday! This one is gonna take some serious thought! Already had a post for today...but this looks like too much fun! I'm in!